The idea for Hee originated from the desire to create an eco-friendly chair from easily recyclable materials. By manufacturing a chair from a single material, the pollution created when transporting the products from one production site to another is avoided. This way, the process of recycling is also simplified. The aim was to take an archetypal chair as a model and to perfect every single detail. The chair is thus elevated to a higher class while making it simpler to use and more functional. As a result, a clear, plain piece of furniture was to emerge, which would easily integrate in different environment - modern, but not too time-specific. There is nothing superfluous about the Hee chair – that is to say, no embellishments. No part could be taken off, without loosing some of its function. The chair has a playful expression, but the design doesn't affect its function. The throw-away mentality and environmental awareness don't go together. Finding a balance was also crucial in the design - in order to combine functionality and aesthetics at a high level, the right wire thickness had to be chosen. 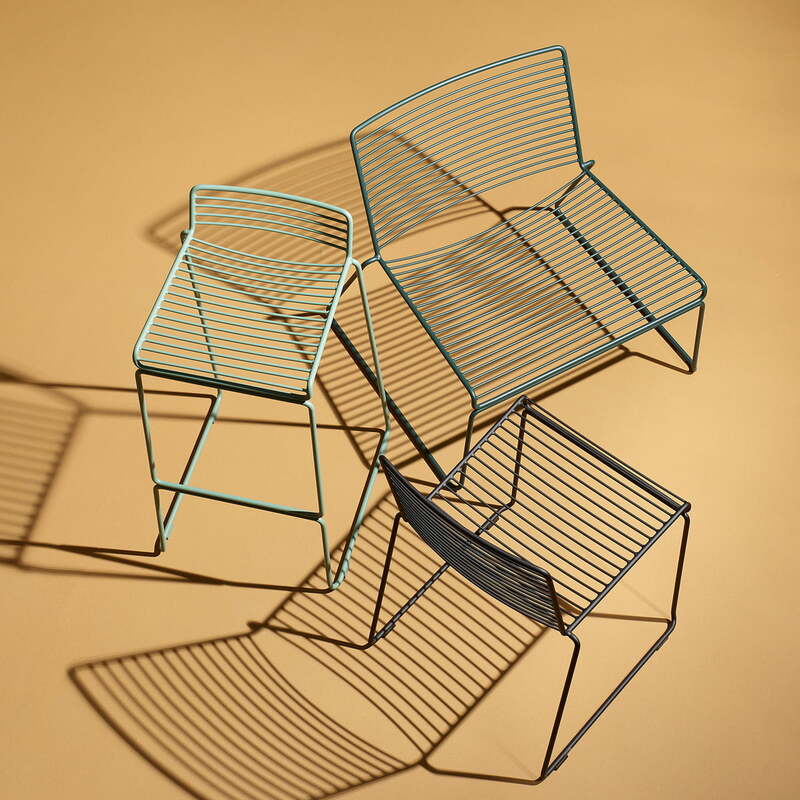 The Hee-chairs, the Lounge Chair and also the bar stool are made of a 11 mm thick metal wire. Their shape is reminiscent of a three-dimensional pencil- sketch. Hee is available as a club armchair, a dining chair or a bar stool. It can also be seen in the new Osloer Opera House and in the Australian parliament. These stackable pieces of furniture are galvanised and powder-coated, so they make great outdoor furniture and can be left out in any kind of weather. The Hee Lounge Chair from Hay in the black variation. This lounge chair is functional and aesthetic and is eminently suitable for use in an outdoor area. 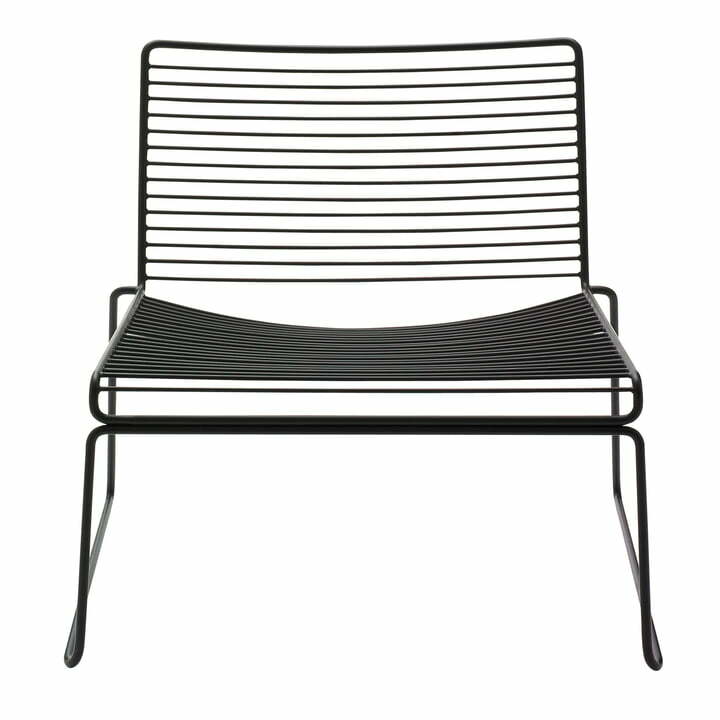 The Hay - Hee Dining Chair, the Lounge Chair and the Bar Stool are all made of metal wire and are therefore suitable to be used indoors as well as outdoors.